Electro-mechanical road barrier for heavy traffic. Fast speed 2.5sec. opening for bars up to 3.0mtrs. Including Orion G BR control unit. • Sturdy and reliable, the BGV barrier is suitable for car parks and passageways with heavy traffic. • Boom balancing can be adjusted, and is controlled by a compression spring. • Provided with an incorporated control panel, BGV is available in low, medium and high-speed versions in relation to its boom length. • Also available in stainless steel. 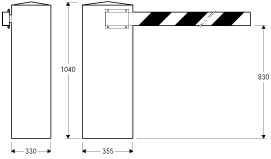 Electromechanical barrier for intensive use • incorporated ORION G BR control panel • various types of accessories, such as skirts, safety edges, lights, rest rods, can be mounted on the boom • articulation 90° or 180° • rest rod • signal indication lights • Main specifications: supply 230V ± 10% 50Hz • power 180W • Models available: BGV 30 with opening speed 3 sec., max boom length 3m • BGV 45 with opening speed 6 sec., max boom length 4.5m • BGV 60 with opening speed 12 sec., max boom length 7m.